Do you have a preventative maintenance schedule? What are some common check-ups and maintenance projects homeowners should make sure they accomplish throughout the year? What about uncommon, often overlooked tasks? Most importantly, what could happen if these maintenance tasks are avoided or put off? These are the questions covered by eLocal‘s 5th question in their Blog Off Series. From the perspective of your homes electrical systems, here are some of the key items that need to be maintained on a regular basis, starting with the items that will have the most serious repercussion if ignored. In most homes, the largest electrical related system is the HVAC (Heating Ventilation, Air Conditioning) and the associated components. Your central units (the air handling / heat and cooling exchanger, and the compressor / condenser) should be inspected twice a year in harsh climates with four distinct seasons, and at least once a year in more stable environments. Unless you are very mechanically inclined, and have a good working knowledge of electrical and mechanical systems, this should be done by a professional. In the air handling / heating and cooling exchanger unit, all manufacturers’ recommendations should be followed, such as lubrication, checking belts for proper adjustment, aging or worn condition, bearing lubrication, fan balance, exchangers cleaned, heat exchangers checked for CO leakage, etc. Electrical components should be visually inspected for signs of heating or arcing in relays, all connections and terminations should be re-torqued or tightened, wires inspected for discoloration, brittle or darkened insulation, or any unusual signs of heat stress. Duct work should be cleaned periodically as well. The most important and necessary item to attend to as the homeowner is changing or cleaning any and all air filters in the system. The compressor and condenser unit should be inspected for many of the same items previously identified. The best step a homeowner can take here is to pay attention to any unusual noise, and especially any changes in the sounds coming from the unit, particularly on a start-up of the system. Any grinding, growling, squealing, anything out of the ordinary should be investigated immediately as to the cause. Clean the unit frequently to rid the cooling fins or protective screens of leaves, spider webs, dust and debris. As for the rest of your electrical systems, there are things that should be done routinely as well. Look, listen, and feel for anything unusual, and pay attention to any changes you notice. Starting with your electrical service, problems such as loose or poor connections can reveal themselves early if the warning signs are investigated. If you hear a buzzing or crackling noise emanating from your electrical meter, or your main breaker compartment, call the electrical utility to investigate immediately. This is likely a loose connection, or a loose jaw in the meter socket that will eventually cause lights to flicker, and loss of power on some or all of your circuits. If left unchecked it can lead to major heat damage to your service panel, and possibly a serious electrical fire. In the branch circuit compartment of your service entrance panel, all connections should be checked and re-torqued on an annual or bi-annual basis. Again, this is something that a homeowner, comfortable and knowledgeable with electrical safe work practices, can safely do themselves if they shut off the main breaker! If there is any doubt, call in a professional. Breakers should be switched on and off to ensure they are working correctly, Arc-fault and GFCI breaker should be tested on a regular basis as per manufacturer recommendations, and all wires and insulation should be visually inspected for signs of heat. All your switches and receptacles should be inspected occasionally as well. Any switches that feel soft, or are warm to the touch, need to be replaced. Any receptacles that are worn, loose, or warm to the touch need to be inspected and connections tightened, or the device replaced. Any GFCI receptacles need to be tested on a regular basis as recommended as well. Outdoor electrical components must have properly fitting and approved cover plates, and the gaskets inspected for wear or deterioration, and replaced if necessary. Check all landscape wiring, transformers, and fixtures, especially after winter to ensure that everything is in good condition. All light fixtures, both indoor and out should be visually inspected and check to see that proper type and wattage of lamps are used as approved for by the manufacturer. Ensure all guards, shades, or glass is intact and in place. A few simple observations and taking remedial action early can prevent costly repairs to your electrical systems, and ensuing property damage, but most importantly you will be taking care of the things that matter most, the health and safety of you and your family. There is some really excellent advice on a huge variety of preventative maintenance routines – everything from electrical to HVAC to plumbing to sump pumps to tools to granite countertops and more. It’s worth taking the time to review this helpful information. Read eLocal’s blog – click here to view it. When and Why Should a Homeowner Hire a Home Professional? 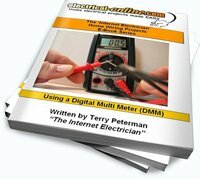 This entry was posted in Electrical Projects, Q & A, Safety and tagged air conditioning, arc-fault breaker, branch circuit, breakers, duct work, electrical components, electrical meter, electrical service, electrical systems, electrical utility, GFCI, GFCI breakers, hating, heating, HVAC systems, lamps, light fixtures, main breaker, mechanical systems, meter socket, preventative maintenance, receptacles, service entrance panel, switches, ventilation, wattage, wires. Bookmark the permalink. How Will Our Homes Change in the Next 5-10 Years?